A Charles Sturt University (CSU) international student work experience placement in a neighbouring but different culture has broadened journalism students’ perspectives and job opportunities. 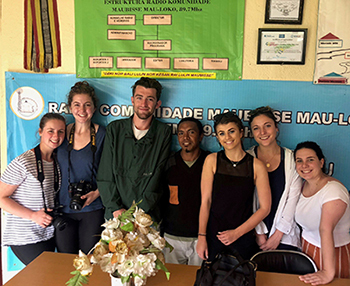 Six final-year journalism students in the CSU School of Communication and Creative Industries in Bathurst explored the people and potential of Timor-Leste during a recent three-week study tour supported by CSU Global. 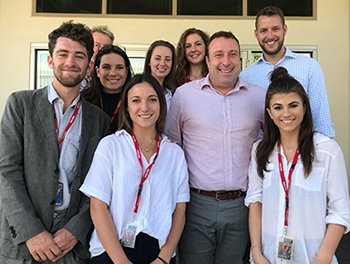 The study tour was subsidised by a three-year New Colombo Plan grant to CSU journalism lecturer Mr Chris McGillion, who has taken CSU journalism students on internships to Timor-Leste since 2016. Five self-funded students went in 2016, and two self-funded students visited in 2017. Mr McGillion liaised with host organisations such as Grupo Media Nacional (GMN), the largest private media organisation in Timor-Leste, before the students arrived. He then orientated the students to Timor-Leste, to its capital Dili, and introduced the students to their hosts. Part of the program also involved a meeting with the Australian Ambassador to Timor-Leste, Mr Peter Roberts,OAM, (pictured left with the students) as well as a trip to the mountains outside Dili, where more traditional village life is common. “The students wrote stories for Diario newspaper which is part of the GMN,” Mr McGillion explained. 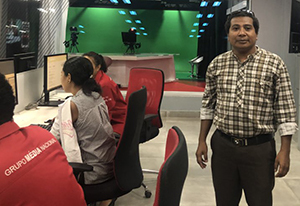 “The Director of Information for GMN is Mr Fransedes Suni (pictured below), a Timorese national but also a 2005 graduate of the Charles Sturt University journalism program. “Suni is responsible for more than 40 Timorese journalists across GMN’s newspaper, radio station, television station, and news website. “Each of the six students published at least two stories in Diario, in both English and Tetun (one of the two official languages of Timor-Leste, the other being Portuguese), and I worked with the students on their first stories. Mr McGillion said that study tour work placements for students such as this trip to Timor-Leste provide them with insights. “Journalism students increasingly find it difficult to distinguish themselves in the mainstream graduate marketplace,” he said. “Interning in Timor-Leste provides unique opportunities to practice journalism in one of the poorest countries in the world, and one where cultural and language barriers must be overcome. “The experience of working in Timor-Leste opens eyes and imaginations to ways of life that students from Australia rarely experience. It presents career opportunities as communication professionals in all kinds of educational and development work. 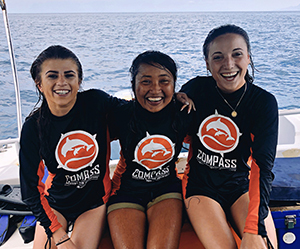 Final-year student Ms Bethan Smoleniec said, “Fellow student Lauren Forbes and I were lucky enough to get to visit the island Atauro for two stories that we each wrote. “It involved us meeting with the island chiefs and talking about the island’s potential for economic prosperity through ecotourism primarily. Ms Smoleniec said, her experience in Timor-Leste allowed her to build on the skills that she has learnt in the classroom and through partaking in internships in Australia, and then apply them to a completely different cultural and societal structure. “This was invaluable for me as both a journalism and international studies student, since engaging with, learning from and sharing stories from around the world is what I hope to pursue in my professional career,” she said. It is hoped that next year even more CSU journalism students will apply to do a Timor-Leste internship. Mr McGillion is also working with GMN’s Mr Fransedes Suni on ways to present basic journalism workshops to journalists at GMN, and envisages this eventually being something CSU students will also participate in. Contact CSU Media to arrange interviews with Mr Chris McGillion and Ms Bethan Smoleniec.